Lackluster sales performance made the Toronado a rather Pyrrhic victory for Metzel, Andy Watt, and John Beltz. They had overcome great odds just to bring the car to market and they had demonstrated convincingly that front-wheel drive could work for big American cars. However, the Toronado was so expensive to build and public interest was so lukewarm that it hardly seemed worth the effort. The contemporary Riviera handled as well or better, had much better brakes, cost less, and was some 250 lb (113 kg) lighter despite nearly identical exterior dimensions. The Toronado’s imposing fastback shape, meanwhile, seemed to appeal more to critics than the buying public while sacrificing much of the FWD layout’s potential packaging efficiency. It might be tempting to look at the Toronado as a proof-of-concept exercise for front-wheel drive, but Beltz later insisted that wasn’t the case. Indeed, Oldsmobile wouldn’t offer another FF car until the 1980 X-body Oldsmobile Omega and the division participated in that project (whose FWD layout was very different from that of the Toronado) only reluctantly. 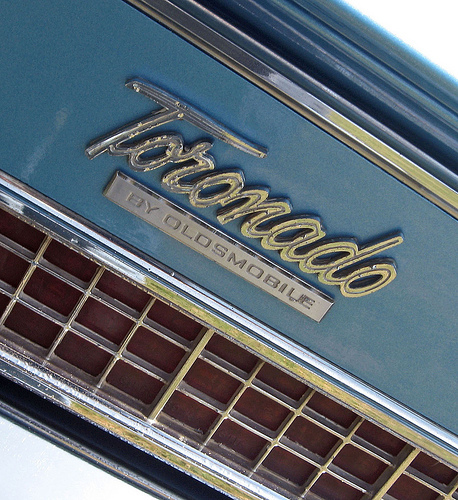 Buyers were definitely aware that the Toronado was FWD — a 1970 Popular Mechanics owners survey found that more than 40% had chosen the Toronado specifically because of the drivetrain — but Oldsmobile did very little to promote that fact. Early Toronado advertising mentioned FWD only in passing — there were none of the highly technical ads that Campbell-Ewald had done to promote the Corvette Sting Ray’s independent rear suspension — and even those references would gradually disappear. We’re not entirely sure why Oldsmobile was so reticent to publicize Toronado’s FF drivetrain, although it’s possible that it had something to do with the Hooven patent; we can understand why GM might have been reluctant to promote an invention on which it may have been paying royalties to Ford. Whatever the reason, Oldsmobile swept its own considerable technical achievement under the rug. If anything, the Toronado may have convinced Oldsmobile that it didn’t really need front-wheel drive, which in the mid-sixties was probably true. In the mid-seventies, buyers would have lined up around the block for an efficient, V-6-powered FWD car like Watt’s earlier prototype, but a decade earlier, we suspect it would have lost out to the cheaper, simpler Ford Fairlane, the same way the Corvair lost out to the more conventional Falcon. With the Eisenhower recession fading from memory and the OPEC embargo still years away, front-wheel drive was little more than a curiosity. In our second installment, we’ll look at the rest of the Toronado’s history, along with an unusual spin-off of its Unitized Power Package concept: the 1973-1978 GMC Motorhome. Special thanks go out to Kathy Adelson of the GM Media Archive for her invaluable assistance in tracking down historical photos for this article. Our sources on the development and evolution of the Toronado included an AC Spark Plugs ad in Popular Science Vol. 191, No. 3 (September 1967), p. 21; C. Edson Armi, The Art of American Car Design: The Profession and Personalities (University Park, PA: Pennsylvania State University Press, 1988); the Auto Editors of Consumer Guide, “1966-1970 Oldsmobile Toronado,” HowStuffWorks.com, 15 October 2007, auto.howstuffworks. com/ 1966-1970-oldsmobile- toronado.htm, accessed 22 October 2010; Ray T. Bohacz, “Mechanical Marvels: Chain Gang: Exploring Camshaft Drive Mechanism,” Hemmings Classic Car #12 (September 2005), pp. 66–69; “Car and Driver Road Test: Ford Thunderbird and Cadillac Eldorado,” Car and Driver November 1966, reprinted in Cadillac Eldorado 1967-78 Performance Portfolio, ed. R.M. Clarke (Cobham, England: Brooklands Books Ltd., ca. 2000); Chris Carlson, “Oldsmobile Toronado,” ClassicOldsmobile.com, 2005, encyclopedia.classicoldsmobile. com/toronado/index.html, accessed 13 November 2010; Linda Clark, “1964 Oldsmobile 4-4-2: Muscling in on the Ponycars,” Special Interest Auto #69 (June 1982), reprinted in Cutlass & 4-4-2 Muscle Portfolio 1964-1974, ed. R.M. Clarke (Cobham, England: Brooklands Books Ltd., ca. 1998), pp. 124-131; Helen Jones Earley and James R. Walkinshaw, Setting the Pace: Oldsmobile’s First 100 Years (Lansing, MI: Oldsmobile Division of General Motors Corporation, 1996); Craig Fitzgerald, “1966 Revolutionary Ride,” Hemmings Classic Car #4 (January 2005), pp. 14–21; John Gunnell, ed., Standard Catalog of American Cars 1946-1975, Rev. 4th Ed. (Iola, WI: Krause Publications, 2002); Maurice D. Hendry, Cadillac: Standard of the World: The Complete History (Fourth Edition update by David R. Holls) (Princeton, N.J. : Automobile Quarterly, 1990); Dave Holls and Michael Lamm, A Century of Automotive Style: 100 Years of American Car Design (Stockton, CA: Lamm-Morada Publishing Co. Inc., 1997), pp. 172-187; John F. Katz, “SIA comparisonReport: 1966 Oldsmobile Toronado vs. 1967 Cadillac Eldorado,” Special Interest Autos #168 (November-December 1998), reprinted in The Hemmings Motor News Book of Cadillacs (Hemmings Motor News Collector-Car Books), ed. Terry Ehrich (Bennington, VT: Hemmings Motor News, 2000), pp. 110-119; Michael Lamm, “Toro & Cord: So different and yet so much alike!” Special Interest Autos #35 (July-August 1976), reprinted in The Hemmings Book of Oldsmobiles: driveReports from Special Interest Autos, ed. Terry Ehrich (Bennington, VT: Hemmings Motor News, 2001), pp. 100-107; Todd Lassa, “Drive: 1966 Oldsmobile Toronado: Rule Breaker: 40 Years On, It’s Still the Most Radical Olds Ever,” Motor Trend October 2005, www.motortrend. com, accessed 22 October 2010; Richard M. Langworth, Illustrated Oldsmobile Buyer’s Guide (Osceola, WI: Motorbooks International, 1987); Jay Leno’s conversation with Dave North, Jay Leno’s Garage, 9 December 2007, www.jaylenosgarage. com, accessed 22 October 2010; Karl Ludvigsen, The V-12 Engine: The Untold Inside Story of the Technology, Evolution, Performance and Impact of All V-12-Engined Cars (Sparkford, Yeovil, Somerset: Haynes Publishing, 2005); Donald MacDonald, “Developing the Toronado,” Motor Trend Vol. 17, No. 12 (December 1965), pp. 40-45; Steve Magnante, “Hurst Hairy Oldsmobile – Keeping the Legend Alive: The Hurst Hairy Olds Returns,” Hot Rod December 2002, www.hotrod. com, accessed 6 November 2010; Mark J. McCourt and Jeff Koch, “Leading the Way,” Hemmings Classic Car #27 (December 2006), pp 22–29; Bob Merlis, “Collectible Classic: 1966-1967 Oldsmobile Toronado,” Automobile February 2009, www.automobilemag. com, accessed 26 October 2010; “Motor Trend Interview: John Beltz,” Motor Trend Vol. 22, No. 12 (December 1970), pp. 72-76, 92-93; “1966-1985 Oldsmobile Toronado,” Automotive Mileposts, n.d., automotivemileposts. com, accessed 10 November 2010; Oldsmobile Toronado ad, LIFE Vol. 65, No. 5 (2 August 1968), p. 16; Oldsmobile Motor Division of General Motors Corporation, “Step Out Front in ’66 … in a Rocket Action Olds! Toronado: New one-of-a-kind car…engineered by Oldsmobile!” [advertisement], Car and Driver Vol. 11, No. 5 (November 1965), pp. 46–47; “Oldsmobile Toronado: The Most Carefully Engineered and Thoroughly Tested Car,” Car Life Vol. 12, No. 2 (November 1965), pp. 28-37; Ken Pilidis, Olds Faithful (the Oldsmobile Northern Lights Chapter newsletter) July 2009, p. 2; “Road Research Report: Olds Toronado,” Car and Driver Vol. 11, No. 5 (November 1965), pp. 29-35, 94-99; Herbert Shudliner, “Spotlight on Detroit,” Motor Trend Vol. 17, No. 4 (April 1965), p. 11; Daniel Strohl, “1968 Oldsmobile Toronado,” Hemmings Classic Car #12 (September 2005), p. 102, and “Success! Cadillac’s OHC V-12 engine photos found,” Hemmings Blog, 14 April 2010, blog.hemmings. com, accessed 19 October 2010; Kris Trexler, “Steve & Matt Butcher’s 1967 Oldsmobile Toronado Deluxe,” North Texas Oldsmobile Club, n.d., clubs.hemmings. com/ clubsites/ ntexasoca/ images/ 1967_Oldsmobile_ ToronadoDeluxe.pdf, accessed 26 October 2010; “Unusual Toronados,” Toronado by Oldsmobile, n.d., www3.telus. net/ toronado/ unusual.html, accessed 1 November 2010; vistacruiser67, “1966 Oldsmobile Toronado Pike’s Peak Hill Climb 425 Rocket,” YouTube, https://youtu.be/ziYJVoaOeiI, uploaded 2 February 2008, accessed 10 November 2010; “Youngmobiles: Can-Am engines and other hot rockets,” Motor Trend Vol. 21, No. 10 (October 1969), reprinted in Oldsmobile Muscle Portfolio 1964-1971, ed. R.M. Clarke (Cobham, England: Brooklands Books Ltd., ca. 1999), pp. 96-99; the Oldsmobile Toronado Wikipedia® page (en.wikipedia.org/wiki/Oldsmobile_Toronado, accessed 13 November 2010); emails to the author from George Camp, Tom Falconer, Tom Matano, Richard Ruzzin, and Gary Smith, 11–28 November 2010; comments and emails to the author from David North, 18–21 November 2018; and comments made by former Oldsmobile engineer William Thomas on the earlier version of this article, 25 April to 29 April 2010. Additional driving impressions for the Toronado came from “Buick Riviera: beauty only skin deep?” Road Test, July 1966, reprinted in Buick Riviera Performance Portfolio 1963-1978, ed. R.M. Clarke (Cobham, England: Brooklands Books Ltd., ca. 2000), pp. 64-69; “Car and Driver Road Test: Oldsmobile Toronado: A giant 400 horsepower, two-and-a-half-ton Mini is a gas, but it’s not for citizens with cardiac conditions,” Car and Driver Vol. 13, No. 10 (April 1968), reprinted in Oldsmobile Muscle Portfolio 1964-1971, pp. 64-67; “Car Life Road Test: Oldsmobile Toronado,” Car Life Vol. 12, No. 5 (February 1966), reprinted in ibid, pp. 43-47; “Car Life Road Test: Riviera Gran Sport” and “Toronado vs. Riviera: An On-the-Road Comparison,” Car Life Vol. 12, No. 5 (February 1966), reprinted in Buick Riviera Performance Portfolio 1963-1978, pp. 56-61; “Cars Road Test: Toronado vs. Riviera,” Cars September 1966, reprinted in ibid, pp. 70-76; John Ethridge, “5 Luxury Specialty Cars,” Motor Trend Vol. 19, No. 8 (August 1967), pp. 68-73, reprinted in Buick Riviera Performance Portfolio 1963-1978, pp. 78-83; “Giant test,” Car October 1966, pp. 44–51; Michael Lamm, “Toronado Owners Really Dig FWD but say Gas Mileage a Bummer,” Popular Mechanics Vol. 133, No. 6 (June 1970), pp. 118-121, “Two fwd giants: Both excel in prestige and gas guzzling,” and “What’s ahead for front-wheel drive?” Popular Mechanics Vol. 137, No. 4 (April 1972), pp. 100-107; “Oldsmobile Toronado (Autocar Road Test Number 2061),” Autocar 14 January 1966, pp. 79–84; Bill Sanders, “Luxury with a Flair,” Motor Trend Vol. 21, No. 2 (February 1969), pp. 74-85; and Don Sherman, “1966 Oldsmobile Toronado: When men were men, cars were cars, and GM feared no technological frontier,” Car and Driver Vol. 31, No. 2 (August 1985), pp. 40-49. Additional information on the Oldsmobile Starfire and Jetstar I, the Toronado’s predecessors in the personal luxury sweepstakes, came from the Auto Editors of Consumer Guide, “1954-1966 Oldsmobile Starfire,” HowStuffWorks.com, 18 November 2007, auto.howstuffworks. com/ 1954-1966-oldsmobile-starfire.htm, accessed 1 November 2010; and Josiah Work, “1964 Oldsmobile Jetstar I: Marvelous Marketing Mistake,” Special Interest Autos #86 (March-April 1985), reprinted in The Hemmings Book of Oldsmobiles, pp. 92-99. Additional background on the F-85/Cutlass came from “Car Life Road Test: Oldsmobile F-85,” Car Life Vol. 8, No. 8 (May 1961), reprinted in Oldsmobile Automobiles 1955-1963, ed. R.M. Clarke (Cobham, England: Brooklands Books Ltd., ca. 1989), pp. 66–70; “Oldsmobile F-85,” Car and Driver Vol. 6, No. 11 (May 1961), reprinted in ibid, pp. 71–73; and “Oldsmobile F-85,” Motor Trend Vol. 13, No. 2 (February 1961), reprinted in ibid, pp. 61–63. Some additional information on GM’s early FWD show cars came from “California Dreaming: Concours D’Elegance to Feature GM Dream Cars from Joe Bortz Collection,” Old Cars Weekly 29 January 2008, www.oldcarsweekly. com, accessed 10 November 2010; Don Keefe, “1955 GMC L’Universelle – Department X,” High Performance Pontiac September 2003, www.highperformancepontiac. com, accessed 27 October 2010; Dave Newell and Robert L. Hauser, “L’Universelle: Front Wheel Drive in ’55,” Special Interest Autos #70 (August 1982), pp. 18-23; Yann Saunders, The Cadillac Database, 1996-2010, Cadillac Database, www.cadillacdatabase. com, accessed 29 October 2010; and David W. Temple, “1955 GMC L’Universelle,” Hemmings Classic Car #61 (OCtober 2009), pp. 52–55. Information on Fred Hooven and Ford’s FWD efforts during this period came from the Auto Editors of Consumer Guide, “Ford Cardinal: Dearborn’s Would-Be World Car,” Cars That Never Were: The Prototypes (Skokie, IL: Publications International, 1981), pp. 50-53; David Halberstam, The Reckoning (New York: William Morrow and Company, 1986), p. 521; Frederick J. Hooven (assignor to Ford Motor Company), “Vehicular Power Plant,” U.S. Patent No. 3,052,313, filed 15 July 1959, issued 4 September 1962; Richard M. Langworth, The Thunderbird Story: Personal Luxury (Osceola, WI: Motorbooks International, 1980); Tim Moran, “The Radial Revolution,” Invention & Technology Magazine Vol. 16, Issue 4 (Spring 2001), www.americanheritage. com, accessed 22 October 2010; George H. Muller (assignor to Ford Motor Company), “Vehicular Power Plant,” U.S. Patent No. 3,213,958, filed 14 April 1964, issued 26 October 1965; Myron Tribus, “Frederick Johnson Hooven,” Memorial Tributes: National Academy of Engineering, Volume 3 (1989) pp. 201-204, reprinted at www.falconregistry. com, accessed 2 November 2010. Background on the Cord 810 and 812 came from the Auto Editors of Consumer Guide, Encyclopedia of American Cars: Over 65 Years of Automotive History (Lincolnwood, IL: Publications International, 1996) and “1936-1937 Cord 810/812,” HowStuffWorks.com, 29 October 2010, auto.howstuffworks. com/ 1936-1937-cord-810-812.htm, accessed 31 October 2010; and Arch Brown, “Supercharged Sensation: 1937 Cord 812-SC,” Special Interest Autos #110 (April 1989), pp. 28-35. Information on the Rochester Quadrajet came from Jim O’Clair, “Rochester Quadrajet Carburetors,” Hemmings Motor News January 2005; Gary Goms, “Diagnostic Dilemmas: Servicing Quadrajet Carburetors,” UnderhoodService.com, 1 May 2008, www.underhoodservice. com, accessed 6 November 2010; George Nenadovich, “Rochester Quadrajet Common Problems and Decoding,” BuickPerformance.com, accessed 1 November 2010; and United States of America v. General Motors Corporation v. Brock Adams, Secretary of Transportation, et al, 565 F.2d 754 184 U.S.App.D.C. 179, Nos.76-1744 and 76-1745, United States Court of Appeals, District of Columbia Circuit, 1977. Additional background and technical details came from “Auto Brevity: Anti-Lock Brake Systems,” Automotive Mileposts, n.d., automotivemileposts. com, accessed 31 October 2010; Patrick Bedard, “A Car Is Born: X,” Car and Driver Vol. 24, No. 11 (May 1979), pp. 62–65; “Car Life Road Test: Oldsmobile Delta 88,” Car Life Vol. 11, No. 7 (April 1965), reprinted in Oldsmobile Muscle Portfolio 1964-1971, pp. 33–37; Mike Covello, Standard Catalog of Imported Cars 1946-2002, Second Edition (Iola, WI: Krause Publications, 2001); John DeLorean, “Universal Joint,” U.S. Patent No. 2,898,750, filed 24 September 1958, issued 11 August 1959; Honda Motor Co., Ltd., “Ascot/Accord, Accord Inspire/Vigor (Fact Book),” 13 September 1989, www.honda. co.jp, accessed 12 February 2015; Geoff Moore, “60° V6 Family Tree,” 60° V6 Website, n.d., 60degreev6. com, accessed 26 October 2010; the Productioncars.com Book of Automobile Production and Sales Figures, 1945-2005 (N.p. : 2006); Don Sherman, “The New Approach: X,” Car and Driver Vol. 24, No. 11 (May 1979), pp. 80–82; and Andrew K. Watt (assignor to General Motors), “Front Wheel Drive Torque Steer Compensator,” U.S. Patent No. 3,283,842, filed 8 December 1964, issued 8 November 1966.